Titanium tableware- Dongguan DingChuang CNC metal spinning Co,. Ltd.
Dongguan DingChuang CNC metal spinning Co,. Ltd. Product introduction : titanium tableware is good for health ,products include cup ,pan ,bowl and so on . Spinning advantages : titanium rebound is obvious that effect the spinning forming,heating spinning can make titanium smooth. 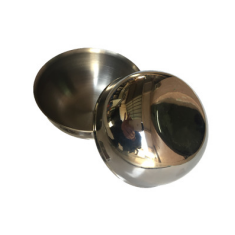 We know titanium is good for people's health ,but it is harder to spin than stainless steel ,the edge of spinning sheet is easy to wrinkle as the the ductility is bad ,then it appear cracking after wrinkling that affect the next step spinning .the spinning roller and mold are easy to wear if you choose the soft mold and roller material ,the polishing will burnout because the thermal conductivity is poor . ③Choosing the high hardness material to process spinning roller and mold .